Picture perfect; create a beautifully coordinated family portrait in the colors of spring. Bring brothers and sisters together in a gorgeous bouquet of colors. Truly a stunning smile maker! These simple, yet elegant, seersucker sleeveless matching sister dresses are offered in a variety of colors: Light Blue, Lilac, Pink, Khaki, Yellow, Green and White, and allow you to design the picture of your dreams. These dresses are designed to coordinate with the variety of boy’s seersucker outfits we offer each spring. The material is a crisp 100% cotton seersucker with white and color alternating stripes. There is an attached crinoline slip that adds a beautifully shaped flare at the bottom of the dress. These dresses are made in the USA by Lito. It is recommended that they be hand washed in cold water and line dried. They are available in sizes 6-12 Mo, 12-18 Mo, 18-24 Mo, 2T, 3T, 4T, 5, 6, and 7. 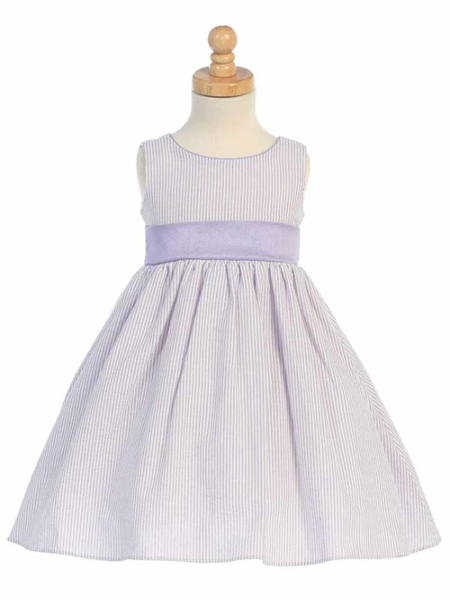 Note: These dresses can be ordered on special request in sizes 8, 10, and 12 however these sizes are not returnable.